St. Petersburg’s confectioners got to the Guinness Book! 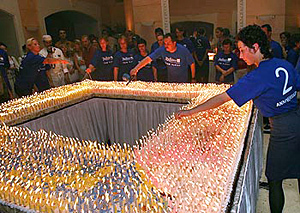 However, as confectioners said, the cake’s size was not their achievement, but the number of candles that were placed over the cake’s surface run up 4500 candles! They resorted to difficult mathematical calculations and special equipment in order to distribute and to light out candles. The candles burned only 2 minutes but there was enough time to hold a record. When smoke had cleared away witnesses of the experiment found it impossible to taste the cake –in some places it had been burnt. But confectioners promised to cover once again biscuit with cream and to treat to all comers. City news archive for 24 July' 2003.